Launched last year by distributor Richard Propper and filmmaker Chuck Braverman, the WESTDOC conference brings together the documentary and reality TV production communities with a two busy days of in-depth panels and a third day dedicated to a pitch fest. For the second year in a row, WESTDOC enticed high-level network and cable executives who primarily work from the East Coast to fly out to Santa Monica to participate in candid, intimate panels revealing how they choose and manage the hit shows on their outlets. "This conference should be in the face of every filmmaker out there," says Marita Grabiak, who spent the last ten years directing scripted TV and came to WESTDOC to pitch a passion project about a photojournalist traveling the ancient Silk Road. Grabiak was determined to meet with executives from A&E, TLC, History Channel and the National Geographic Channel, and was delighted to find all four appearing on one panel, after which she was able to meet each exec and score an e-mail contact for a formal pitch. "The network programmers and the filmmakers coming together, it's like a two-way street of panning for gold," Grabiak exclaims. "It's a symbiotic relationship that seems to work well for both." Attendees also got the chance to meet and pitch execs in two other settings: "Sit Down" sessions, where execs give an overview of their outlet's programming, and the "Face Time" sessions where filmmakers have 15 minutes for a one-on-one pitch. the documentary community and refresh her contacts in reality TV. "I'd love to stay in documentary," says Torre, "but it's very hard to make a living in documentary so you kind of have to balance that with-unfortunately--reality television." hosted by President and CEO James Ackerman. also stated that The Documentary Channel has no intention of moving in the direction of "reality TV," and is committed to staying the course of programming nothing but straight-ahead documentaries. we have more slots open for one, two-hour specials," noting that Nat Geo had opened an acquisition branch just this year. passion project, for your vision, for the story that you want to tell...It's not just like there's one channel. It's not just PBS. There's all these different ways that you can tell stories, real stories about real people. So keep up with your passion; don't give up." Another hot topic at WESTDOC was going beyond the perennially confusing topic of how, where and for how much to digitally distribute your documentary to the latest trend: fundraising via crowd-sourcing. Innovative marketeer Peter Broderick covered this latest trend in a panel on "crowd-funding," explaining how fundraising websites Kickstarter.com and Indiegogo.com give artists the chance to appeal to a worldwide general public for funding. But such successful sites have proven to filmmakers the power of engaging an audience of strangers during the production of your film. "You think it's about raising money," said Broderick. "No. You've got to go out to audiences early; you've got to get their feedback." Broderick argued that filmmakers should start to embrace a Wikipedia mindset that invites participation and, ideally, loyalty to a film. "You can't make a documentary in a cave and then finally when it's done show it to somebody," he maintained. "You need to involve people--strangers now, not just friends and family--and get reactions, get feedback and get responses." Case in point, the winners of this year's WESTDOC Pitchfest, James Swirsky and Lisanne Pajot, raised $23,000 on Kickstarter.com for their documentary about quirky game developers, Indie Game: The Movie, but at the same time raised quite a bit of buzz, finding that many filmmakers at WESTDOC had already seen, and become fans of, their project on Kickstarter. 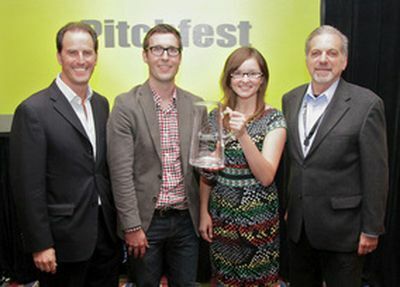 WESTDOC Co-Founders Richard Propper (Ieft) and Chuck Braverman (right) flank filmmakers James Swirsky and Lisanne Pajot, winners of this year's WESTDOC Pitchfest. You can hear Broderick speak about the new world order of distribution at his seminar "New Rules of Crowdfunding" November 13 in New York and November 20 in Los Angeles. For more information, visit www.peterbroderick.com. You can see Nicole Torre's documentary Houston, We Have a Problem on Planet Green or, because she retained her DVD sales rights, buy the DVD directly from her at her website: http://www.houstonwehaveaproblemfilm.com/orderdvd.html. For a complete list of this year's WESTDOC speakers, visit www.theWESTDOC.com.